Colombia’s national indigenous organization sent out an alert for possible violent police attempts to end protests after one native Colombian was “assassinated” by police in the southwest of the country. According to indigenous organization ONIC, there exists a severe risk for more deadly violence at indigenous protest sites in Meta, Nariño, and Santander where indigenous peoples have blocked roads to oil and gas fields. Also in Cauca, where a 19-year-old protester was shot dead and scores were injured on Tuesday, fears for more violent police action persist after Interior Minister Nancy Patricia Gutierrez refused to withdraw security forces. Police, the military and allegedly armed civilians attacked the protesters ahead of the negotiations with Gutierrez, further diminishing the indigenous peoples’ trust in the willingness of the administration of President Ivan Duque to come to any agreement on indigenous rights. Gutierrez told press that talks with the Nasa people in Cauca would continue on Wednesday “with a human rights committee,” but wouldn’t guarantee the protesters would not be subjected to more violence. Black minority leaders, whose communities have also joined the protests, expressed similar fears for police repression. 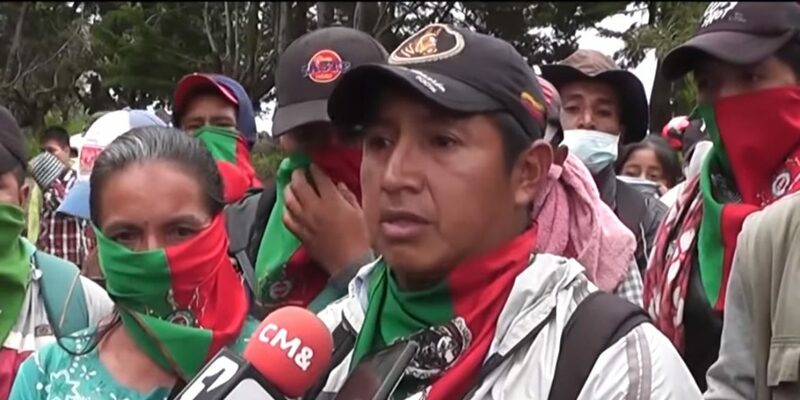 “The [anti-riot police unit] ESMAD, the police and the army came to threaten our guards with rifles,” Victor Hugo Moreno, the leader of the Association of Community Councils of Northern Cauca said on Facebook. Last weekend we held an extended assembly of the community councils of the northern part of the Cauca where the firm decision was made to join the “minga.” Since we decided to concentrate yesterday, we have been persecuted by police dressed in civilian clothing. Meanwhile, indigenous groups from across Colombia have either mobilized, or have called their peoples to assemble to vote on whether they will also mobilize and possibly block roads. International human rights organizations have expressed their support for the indigenous protests and have called on Duque to end his resistance to talk to the indigenous. The president, who has received the support of the country’s far-right, has said he would not talk to the native Colombians until after they end their protests.